Turkey's President Recep Tayyip Erdogan receives representatives from Jewish communities in Washington D.C, US on 30 March 2016. 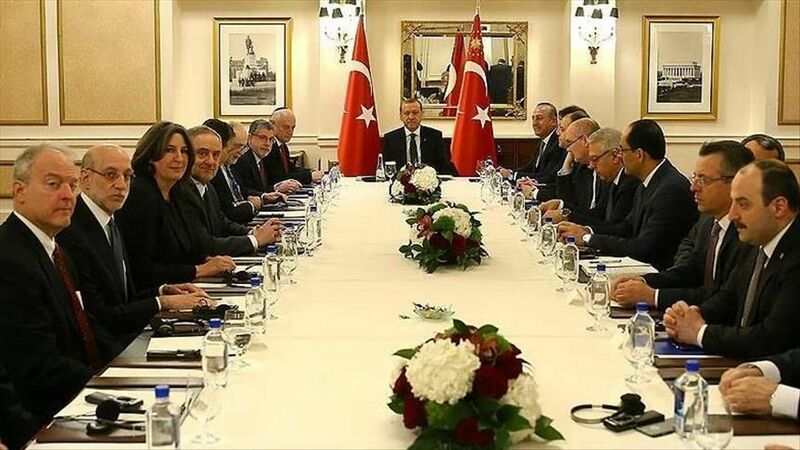 Indeed, if anti-Semitism in Turkey really was a burning issue for those U.S. Jewish groups, it’s ironic they sat down to meet the president who’s shutting down and sanctioning precisely those critical media outlets who speak out against hate crimes, while the pro-government press is still free to spread anti-Semitism and other forms of bigotry. However, contrary to the claims, some media organs had trustees appointed to them due to their relations with terrorist organizations, and were not shut down. On 3 March 2016, a Turkish court had decided to appoint trustees for the Feza Gazetecilik media group which includes the daily Zaman and its English language publication Today’s Zaman, as well as the Cihan News Agency and Aksiyon magazine.2 The decision came upon accusations that the outlets were supporting the Gulenist terror organization, which is a clandestine group headed by US-based Turkish preacher Fethullah Gulen that has infiltrated the country’s institutions including the judiciary, the army, the police and the intelligence services. The organization is accused of conspiring against the state, wiretapping thousands of people including government officials and encrypting phones. Another court decision on the appointment of trustees was given to the Koza Ipek Holding on 26 October 2015 after the holding was suspected of illegal money transfers to provide financial support for the Gulenist terror organization.3 Trustees were appointed to all 23 companies of the holding including four media organs - the Bugun and Kanalturk TV channels and the Bugun and Millet newspapers.